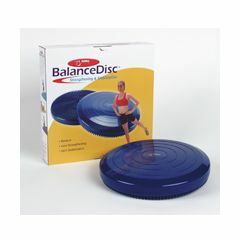 Cando Vestibular Balance Disc - 14"
FitBALL Balance Disc - Blue 14"
Allegro Medical presents the FitBALL Balance Disc. The FitBALL balance disk is a versatile core stability cushion that easily adjusts for your challenge level. It adds an element of instability to your workouts, which ultimately improves your balance and stability. Not full of air. Not Effective. the unit is not very full of air and my foot bottoms out which makes it not very effective to us. Strengthens. Sturdy. Comfortable. Easy To Use. Sturdy. Strengthens. Comfortable. Easy To Use. Easy Storage. Good Value. Durable. High Quality. Easy To Setup. Quiet Operation. Compact. Targets Muscles. Easy Setup. General Fitness. Back Pain Relief. I use this product on my chair when I am working at my desk. It helps my posture and I am much less tired after sitting for long periods when using this product. Sturdy. Easy To Use. Strengthens. Comfortable. I have bought several of these to use with hyperactive elementary age children as a "wiggle cushion." They sit on the discs at their desks. The rule is that if the kids use them as toys, the teacher takes them away for the rest of that day. Most kids love them and it appears to help them stay in their seats better. I have seen sixth graders jump on the discs with all their energy and still not damage them. I have had some discs for several years and they remain inflated and are durable. I strongly recommend them and wish I could afford one for every child in the schools I work at. Sturdy. Comfortable. Easy To Use. Good Value. Durable. High Quality. How do you properly inflate this disc? I haave a pump with both the cone & needle attachments. Neither one is working to add more air to the disc. I've been using a rebounder and am going to be traveling. Is it possible to use this to gently bounce on to stimulate lymph? I just wanted to drop a quick line to say THANK YOU. Just as you promised my travel nebulizer and wheelchair bag showed up at my front door today. I definitely would say that your service is above and beyond the call of duty. You are the reason I deal with Allegro and not with one of the many other vendors out there via the web. You have been consistent with excellent service (in this day and age service means a lot). Just wanted to let you know that have a full 10 ATTA BOYS from me. Again, THANK YOU. If you would like to share this e-mail with a superior/supervisor or other you have my consent. Should they have any questions, they may contact me. The order arrived on Friday...what excellent service. I really appreciate your prompt service, to try and get my order processed, very quickly, so, it could get in on Friday.. Great job, excellent service.